No matter what you try and do paperwork and files keep piling up and taking over your work space; you’re cramped and can never find what you’re looking for. If this situation sounds familiar to you, StoreMoreStore has a solution that will save you space while keeping you organized, an Oblique Shelf Organizer. The Oblique Shelf Organizer is a space efficient paper management system for documents, files, forms, literature, mail, and more. All you have to do is assemble the Oblique Shelf Organizer and set it on your open shelving. 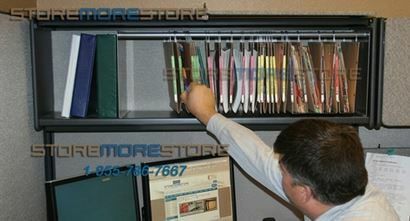 Simply categorize your paperwork into the hanging file folders and put them on the Shelf Organizer. It’s that easy to get organized. 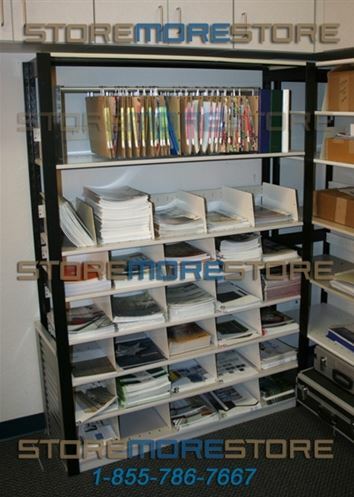 The Shelf Organizer Units are available in standard widths of 33-3/4”, 39-34”, and 45-3/4” and come with a free set of Oblique V-base and Box-Base side tab folders with magnified label holder viewing lenses. Curious to know exactly how much space you can save with Oblique Shelf Organizers? Well here is an example for you. If you have 60” of literature stored on six shelves, you will use 21 square feet at an estimated cost of $450. Just one 40” Organizer unit uses just 4 square feet and costs $200. 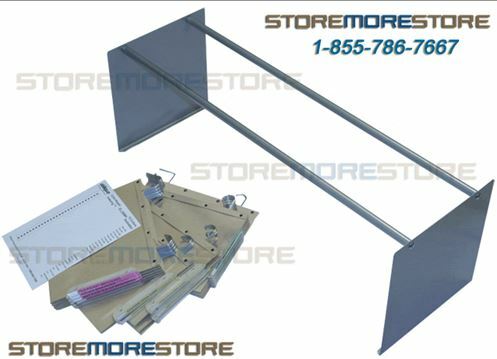 Shop now at StoreMoreStore for your Oblique Shelf Organizer to save space and organize paperwork! If you need custom size to fit your space or have any questions, you can always call us toll free at 1-855-786-7667.